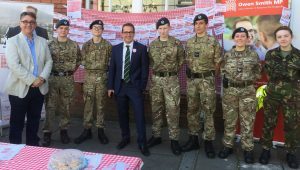 Assembly Member for Pontypridd, Mick Antoniw and Member of Parliament Owen Smith held a ‘Great Get Together’ event at the Beating the Bounds festival in Llantrisant on Saturday. Their Great Get Together stall was part of a nation-wide series of events inspired by the life of Jo Cox MP, who was murdered one year ago. 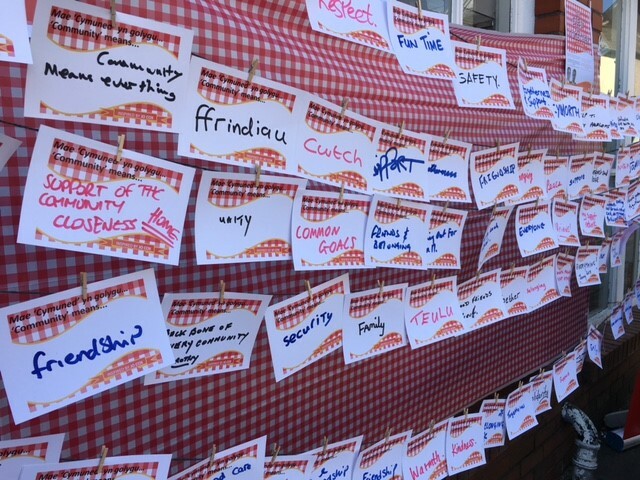 Visitors to the festival were invited to spend time chatting with Mick Antoniw and Owen Smith about what ‘Community means to them’ over a free Welsh cake. Their thoughts were captured on a series of ‘Community Means’ notes, which were displayed on the stall. “Beating the Bounds is a much-anticipated celebration of Llantrisant’s proud history as a historic town – dating back over 600 years. “Organised by Llantrisant Town Trust with the support of Llantrisant Community Council, over 10,000 people travel from far and wide to see a truly unique cultural event that is held every seven years. “My friend and colleague Jo Cox MP who was murdered one year ago and communities across the country held events this weekend to remember her message: that we have more in common than that which divides us.